Listen Up for Your Daily Banks County Middle School mimoLive Announcement! For some students, becoming a TV personality is a dream of the future. For the students at Banks County Middle School in Georgia, it is the first bit of fun in their day thanks to faculty member John Fuller. BCMS’s morning television show has transformed the daily announcements into a fun program run by students. Banks County Middle School has always had a morning television program, but before the facilitator’s baton was passed to John, it was broadcast over the school’s closed circuit channel using a camcorder run directly for the picture and a handheld dynamic microphone run through a mixer for audio. John wanted to find a way to improve the quality of the morning show and increase student involvement. He was familiar with Final Cut and Photoshop, so he started searching for a way to do it live in order to make the show look like a real broadcast. At first, he didn’t find many options for running live chroma keying, moving backgrounds, lower thirds and graphics all at the same time – most of the solutions he found were workarounds or involved some coding that was over his head. A friend recommended mimoLive and John downloaded the demo. 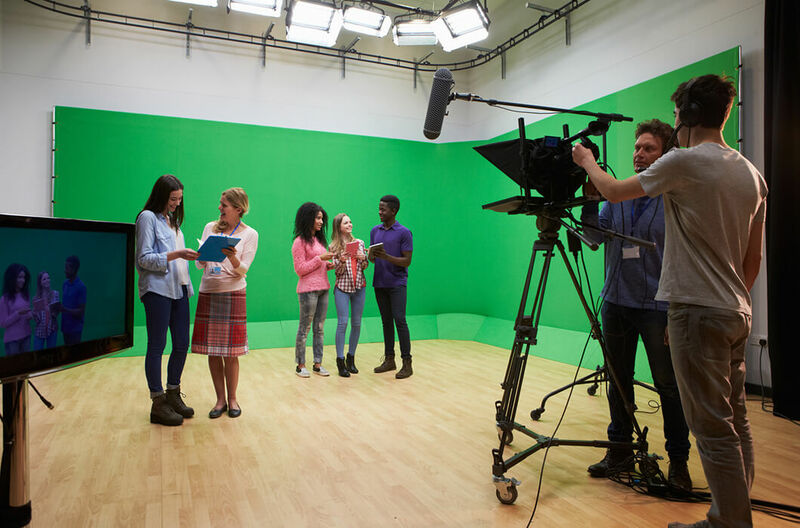 Exclusive to eighth graders, students interested in working on the program as a host, a teleprompter operator, a camera operator or a mimoLive operator are invited to fill out a short application and then serve on the crew for a month before a new crew comes in. Each new crew has its own personality, and John says it’s their differences that keep the show entertaining. Once John sets up the software and explains to a new crew how to operate the layers, they are usually off and running in about ten minutes. By the third show, each student is able to run the broadcasting software without him. John loves that the layout is not intimidating even for beginners. It gives them more time to focus on the show itself. Daily announcements generally consist of a similar format and order, but the script is updated every day. Program highlights include the Pledge of Allegiance, a moment of silence, what’s on the lunch menu, what the weather will be, the fishing forecast (after all, it is a rural school! ), a joke of the day, club activities, sports team game updates and a closing statement from the principal, who offers students words of wisdom. BCMS primarily uses live broadcasting for daily announcements, but they have utilized it in ways beyond that, too. Each year, the middle school students put on a talent show in the gym and broadcast it. John brings in spotlights and backdrops and a projector screen to broadcast the show for everyone to see. They even have the student body vote for a winner over text message. Some students have even come to John asking to use the equipment and software for their class projects. He has seen many ideas come to life, including news reports for historic events students are studying and students interviewing each other as they pretended to be characters from the books they are reading. The school also broadcasts its latest system-wide spelling bee to all of the students. The faculty at Banks County Middle School has gone above and beyond to give their students the broadcasting experience of a lifetime, and the videos are super fun! For Banks County Middle School’s show, John uses mimoLive, a MacBook Pro, a Sony HandyCam via FireWire to the MacBook, a USB Snowball Mic, a Behringer UCA202 audio interface, an Apple Mini DisplayPort to VGA Adapter, a generic VGA to RCA converter, TeleKast (a free teleprompter software he runs on a spare PC) and green paint for a handmade greenscreen. Try bringing mimoLive into your school and see what your students come up with!